Great for fans of the Little Bear series, this collection of four sweet stories of friendship and discovery makes a perfect new baby gift. This collection of simple, short, and irresistibly sweet stories about Baby Bear finding things--and figuring out what to do with them--includes "Baby Bear Finds a Book," "Baby Bear Finds a Flower," "Baby Bear Finds a Baby Bird," and "Baby Bear Finds a Friend." 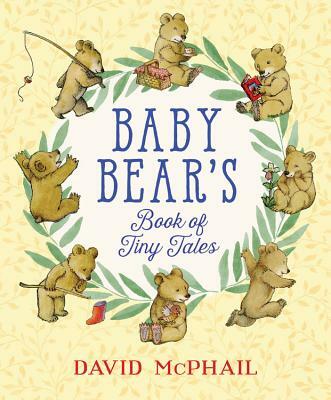 Charmingly written and illustrated by celebrated artist David McPhail, the impeccably classic feel of the text and art will take readers back to Sendak's Little Bear and Lobel's Frog and Toad books. David McPhail has been a passionate artist since the age of two. He studied at the School of the Museum of Fine Arts in Boston and began illustrating books for children in 1971. Since then he has helped to create over one hundred books, including the first book starring Baby Bear, I Promise; the celebrated Mole Music, a New York Times Best Illustrated Book of the Year; and the bestselling If You Were My Bunny, Lost!, and Drawing Lessons from a Bear. David lives in New Hampshire. "McPhail's latest offering is distinguished by an old-fashioned sweetness... The innocence and gentle tone of these "Tiny Tales" pays homage to the original Little Bear by Else Holmelund Minarik." * "Reminiscent of books from another era, this is a collection of four short stories about an active and curious little bear named Baby Bear. The book is similar in look and format to the Little Bear series by Else Holmelund Minarik and many of the short story collections by Arnold Lobel. The illustrations, completed in ink and watercolor, are warm and beautiful and add to the nostalgic charm of the book. The pictures are so well done that they alone could tell the stories." "McPhail subtly reminds readers that they, too, are capable of accomplishing quite a bit. These simple, well-structured stories are suffused with warmth and a spirit of generosity, and the book is ideally suited to burgeoning readers who are eager to put their developing skills to the test." "Young readers will be drawn easily into Baby Bear's world." "Warm affirmation that will just suit a small reader's sensibilities." * "With meticulous inking and a palette of watercolors that glows with the soft colors of dusk and twilight, McPhail portrays an animal world where sleep is a welcome visitor and bedding down is an eloquent expression of personality."